Join Gina Rubel and eWomenNetwork's King of Prussia Chapter for the organization's first 2009 accelerated networking event on January 20. This is a must-attend event! What: eWomenNetwork’s King of Prussia Chapter will host its first 2009 accelerated networking event on January 20 led by keynote speaker Gina F. Rubel of Furia Rubel Communications. Rubel will address “The Strategic Approach to Building Your Business Through Public Relations” and will provide tips on how to consistently and effectively execute public relations tactics to increase the bottom line. Informal networking will begin at 11AM. The formal networking and main program is scheduled from 11:30AM to 2PM. Where: The event will be held at Chadwick’s - The Club at Shannondell located at 2750 Egypt Road in Audubon, Pa.
About the Event: There are many public relations tactics you can employ to develop new business and increase existing business. Tactics designed to increase awareness among your target customers, create an ongoing buzz and position you as an expert in your industry will inevitably increase profit. Rubel’s program, “The Strategic Approach to Building Your Business Through PR,” provides tips for you to consistently and effectively execute public relations tactics and increase your bottom line. Event attendees will walk away with simple tactics to use to generate positive awareness; know-how to create an effective public relations program; know-how to become a resource for the media; and details on where to go for more information. The event is will cost $45 per person and $35 for eWomenNetwork members. All late registrations will be charged $55 as of January 15, 2009. For more information on the event, contact Rosemary Russell at (610) 864-6186 or rosemaryrussell@eWomenNetwork.com. About Gina F. Rubel, Esq. : A communications expert, attorney, author and publicist, Gina F. Rubel, Esq., is the owner of Furia Rubel Communications, Inc., a certified woman-owned public relations agency in Doylestown, Pa. Gina is the past president of the Women’s Business Forum of Bucks County. She was honored by the Philadelphia Business Journal as a 2008 Woman of Distinction, by Governor Rendell with the PA Best 50 Women in Business Award and by the Public Relations Society of America Philadelphia Chapter with the Deanne White Award for Community Service. Her agency was recognized as a Women Business Enterprise nationally by Women's Enterprise Magazine and received three Philadelphia Business Journal Top Corporate Givers Awards in 2008. To learn more, visit http://www.furiarubel.com/. About eWomenNetwork, Inc.: eWomenNetwork is the fastest growing networking resource connecting women and business. The King of Prussia Chapter serves the business community of the Delaware Valley and brings businesswomen together not only for the benefits of networking but also to provide the knowledge and skills necessary to succeed in the business world. For more information on the event and the eWomenNetwork King of Prussia Chapter, visit www.events.ewomennetwork.com/event/details.php?eid=9767. As many of you know, Katie and I are big fans of Twitter and writing blog posts about the best practices of using this online social media tool. One of Katie’s recent blog posts presents some other opinions out there about Twitter’s effectiveness in public relations, but I still think it is an interesting social media tool that should be explored. I recently found an article on Ragan.com about a new internal Twitter-style tool called Yammer. It is similar to Twitter but solely limited to internal use within your organization. Messages are private and also can be targeted to specific work teams. If you're not familiar with Twitter there are many previous posts here on The PR Lawyer to reference. Like Twitter, Yammer is free. However, for a small fee offices can upgrade and use other tools such as password protection and customization. Some key differences that set Yammer apart include, no limit on message length, the ability to add attachments and the ability to send messages to large groups. Yammer´s CEO, David Sacks, says the main goal of the tool is to make Yammer easy to use at work. Much like Twitter, users can ´yammer´ about brainstorming sessions, valuable Web links, or happy hour sessions. However, Yammer is used in place of e-mail and allows for a bigger group discussion environment. E-mail can now be saved for communication that needs a more specific, business-related matters. This could be an interesting tool to check out for your internal company needs. Let it be known that I share the following begrudgingly, but with the belief that like a good news outlet, The PRLaywer should be unbiased. As much as I love Twitter, Stephen Baker of Businessweek’s Blogspotting raises a valid point about the…umm…downside of Twitter here. If you’re like me, you get just a little excited when someone new starts following your tweets. But how many followers actually see your tweets on a given day? Therein lies the problem. If they are logged in and tweeting at the same they may see it, but with so many people tweeting your tweet will be knocked off their radar probably within an hour or so. Which begs the question, if a tree falls in the forest and no one is there to tweet about it, does it make a sound? Ok, not a perfect analogy, but you get the idea. Baker’s blog made me think twice about how much PR is really garnered from tweeting. By no means am I saying should you stop tweeting. Twitter still connects you to people with whom you may never have had contact. And, it’s just plain fun to see what people are saying and weigh in with thoughts of your own. To optimize your Twitter presence, I recommend tweeting @ people. Doing so could build new relationships and lead to potential new business or networking opportunities. Also, Facebook and Plaxo have Twitter applications which send your tweets directly to your profile page. This means that even more people in your network will see what you have to say. All-in-all, Twitter may not be perfect, but it’s still a wonderful PR tool. As with all commerce, the public relations industry is facing challenges we have not seen in decades, from budget cutbacks to on-hold RFPs, from layoffs to clients who ask us to do more with less. Ken Jacobs believes that the most important skill we must develop within our teams to get through the challenging times ahead is that of leadership. We agree. In his article which appeared in The Public Relations Strategist and PR Tactics and the Strategist Online, "From Manager to Leader," Ken Jacobs shares the insights of some of the public relations’ industry's top leaders including: Tom Coyne (president and CEO of Coyne PR), Joel Curran (senior vice president and managing director/midwest region of Manning, Selvage and Lee), and Brian McPeak (vice president, corporate communications and public relations, Rohm & Haas), among others. Ken’s article is well worth the read. During economic downturn or company turmoil, solid leadership can be the determining factor in your firm’s survival. Jacobs outlines skills that distinguish a manager from a leader and he encourages individuals to develop these skills early on in their career. Navigating Social Networking Sites: To Join or Not to Join? People today are more strapped for time than ever, which makes Dan Schawbel’s recent blog on Mashable-Twitter, Facebook, Digg: Can You Join Too Many Networks? especially topical and a great resource for those in the working world. Schawbel urges readers to be selective when deciding on which social networking sites to join. With so many sites to choose from, it may be difficult to determine which is best for your specific professional needs. Below are recommendations based upon Furia Rubel’s work with our clients and their successes. Facebook. Facebook is the pre-eminent social networking site for the 18-24 set, and increasingly for professionals and people in their 30s and 40s as well. With almost 200 million users, MySpace is technically the largest social networking site, but Facebook has a level of credibility and innovation which MySpace has so far been unable to match. Facebook has a social component to it which makes it a great resource for networking and re-connecting with old friends, classmates and colleagues who could potentially be new business prospects or referrals. It is better for showcasing your personality than your business credentials, but an appropriate Facebook profile with information about your business could open some doors. LinkedIn. LinkedIn is often referred to as “Facebook for grown-ups.” With more emphasis on business networking and less on socializing, LinkedIn users are professionals hoping to grow their professional circle and their business. Unlike Facebook applications like Bumper Sticker, Super Wall and the recreational-like, the applications recently introduced to LinkedIn are more geared toward business, especially carrying out office tasks with greater ease. If you join one social network with a goal of generating new business, I would recommend LinkedIn. Twitter. With its 140-character tweets, and the help of supplemental sites that allow you to track what other people are saying about your business, Twitter is an easy and efficient way to promote your business and connect with people. While building a Facebook page or Twitter profile can be time intensive, Twitter allows you to post short blips and let other people find you. A link on your company’s website to your Twitter page will grow your following tremendously within the span of a few days. There are many other social networking sites out there, but Schawbel urges, and I agree, that individuals should avoid joining too many, or those that seem like they could fizzle. The best way to determine which to join in my opinion is to go with the tried and true, and those that have a million users or more. Realize that social networking sites do take time- both to start up and maintain, but they come with measurable PR benefits and business development potential. Set aside a few hours to build your social network profiles, and then a block of time each day to maintain them to avoid getting overwhelmed. More and more people are turning to the Internet to find information on businesses and services, which is great news for small businesses and companies with small advertising budgets. While in the past people relied solely on phone books or recommendations from their network, now, they’re utilizing Internet search engine results, according to an article on Small Business Trends online. According to a comScore survey sited by the article, 31% of people are now using search engine results to find local businesses, while 30% are still using Yellow pages and White pages. What this means from a PR standpoint is that businesses hoping to garner additional exposure should allocate monies to building a user-friendly, search engine optimized Web site that will rank high in search engine results. This is also good news for YellowBook and other Yellow Page publishers. Yellow Pages are still among the top ways people find businesses they're looking for. And since YellowBook has such a solid Internet program, they come up in the search engine rankings too. Stretching the dollar by finding cheap or free ways to create publicity seems to be a constant struggle for many non-profits. They can now use sites like Facebook and LinkedIn to help raise awareness for their cause. The beauty of these sites is that they're free of charge! The potential for growth with social media is endless. One organization, American Board for Certification of Teaching Excellence, has become a model for other non-profits. The goal of the organization is to encourage ¨mid-career professionals to consider a career in teaching.¨ Mike Holden, director of public relations, tells more about how the organization created a team to focus on social media outreach. The team asks employees to encourage their friends and families to visit their sites so the company’s message is spread by people that are known and trusted. Meeting and goal setting has become a big priority for the team. Every two weeks, they come together to brainstorm and set new objectives. Their response on Facebook has been especially successful with fans of the page tripling in numbers over night! This word-of-mouth marketing is a great tool for non-profits because it uses the social network of employee’s friends and families to get started. To read more about the effective use of social media for a non-profit, check out this article on Ragan.com by Sarah McAdams. 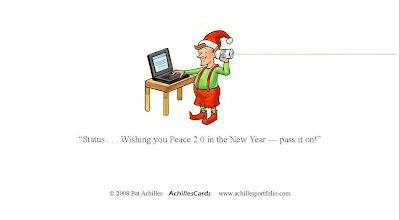 So, in keeping with my most recent posts about holiday cards - here's another fun digital holiday greeting http://www.alliedpixel.com/holiday/2008/ from AlliedPixel. It's well branded, tells a story, clever use of technology, showcases their expertise in video and digital production, and is entertaining. In terms of the snail mail cards, our team has received three so far that stand out. The one I referenced is a previous blog, one from Drexel University with a 3-D branded pop-up paper ornament (clever) and one from a colleague, Carol Cunnigham, of Cunningham Consulting, who used the products of www.reproduct.net. ReProduct manufactures greeting cards and envelopes using environmentally friendly materials. They can be refolded and mailed back (no postage necessary) to be reused in the manufacturing of Shaw carpets. Feel free to send us your nominees for the best holiday messages, digital or print. We'd love to hear from you. "The New Jersey Supreme Court ruled today that it is ethical for lawyers to advertise in Super Lawyers and Best Lawyers listings -- striking a blow for lawyer's freedom of speech. Click here to read the 22-page ruling. The ruling vacates the notorious Opinion 39 of the committee on Attorney Advertising, which ruled in July 2006 that advertising by lawyers with designation “Super Lawyers” or “Best Lawyers” is prohibited as a form of unethical comparative advertising that is also likely to create an unjustified expectation about the results the lawyer can achieve. See “Super Lawyers” and “Best Lawyers” Designations Banned in New Jersey. The Supreme Court backed the findings of a Special Master who reported on June 18, 2008 that 'advertising by attorneys [is] a form of commercial speech protected by the First Amendment and may not be subjected to blanket suppression.'" Personally, I'm don't believe we've seen the last of this ongoing issue but this is certainly a start. Here's wishing everyone peace, positive publicity and prosperity in 2009! 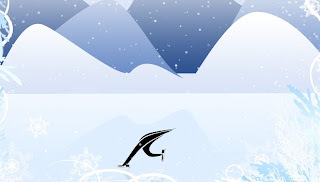 My husband sent me a link to the Yellowbook holiday e-card today at http://www.yellowbook.com/seasonsgreetings. Here is another example of an electronic holiday greeting that is very well done: very professional, extremely creative, well branded and a good use of technology. So like I said in my Dec. 2 blog, if you’re not going to do a great job on your e-card, please think twice about sending one. A well thought out, clever holiday card is always more effective. I also received an adorable and original photo of a yellow lab with a Santa toy in his mouth wearing reindeer antlers from a photographer. The only problem is, the card isn't branded so I don't know who the photographer is or how to reach him/her. Lesson: don't forget the details. The large electronics retailer Best Buy tapped into their internal talent of Generation X workers to form a team for their new Best Buy Employee News, employee intranet. Six employee volunteers were chosen to work on the project, which has proven to be a successful way for management to send out information and news as well as to receive feedback from employees. Some features of the newsletter include: News for My Job, News for Everyone and News for My Location. Sections have headlines that can be previewed with a short summary of the article by the movement of the mouse. Viewers have the option of subscribing to industry and competitor news stories; and even viewing them in Spanish. The intranet invites employee comments after each story in order to gain immediate feedback of what news is valuable and what is not. In addition, when a new product is not getting good reviews from customers, employees are able to quickly forward their comments and experiences to management. The intranet has been a great improvement from past communication practices. The constant turnover of news and other product information was too much for the Director of Employee News, Barry Johnson, and his staff. According to the article, "On top of the constant content demand, it took three separate systems to distribute via e-mail and reach corporate and stores." Best Buy Employee News is now faster and more convenient to get news out to stores across the United States. Johnson had this to say about the project, "The leadership at Best Buy created a culture that is honest and open, not hierarchical, so it is right for social media. We focus on employees' strengths; we focus on what they're good at." This article was really interesting to me because it showed Best Buy's efforts to promote their employee relations. They reached out to employees and capitalized on their talents with social media and Web 2.0 resources. It has been beneficial for everyone because employees have a voice and management has a platform for rapid news dissemination and a way to communicate with all employees. To read more, please follow this link. The recent Yellowbook campaign launched by Gotham New York shows TV advertising at its best with a witty spot, titled "The Breakup." It features an attractive young woman who is video chatting with her boyfriend in her futuristic living room. All of a sudden, he drops the bad news, "This isn't working. I just want to be alone." as a scantily clad model appears behind him on the screen! Revenge is bittersweet and the young woman immediately hangs up and, of course, goes to yellowbook.com. She quickly scans the pages for an answer, "Couple’s therapy? Chainsaw? Pawn shop? Personal trainer?" The best twist of the ad is the fact that the ending is up to the viewer. The ad drives traffic to yellowbook.com where there are three options to choose for the ending. While at the Web site, they are able to see the variety of features Yellowbook has to offer, including peer reviews; which plumber is the best in your neighborhood or what drycleaner is the closest to your house. The good news for me is that there is paginasamerillas.es here in Spain so I am able to have the convenience of Yellowbook overseas as well! To read more about the review on Adage.com by Bob Garfield, please follow this link, Open-Ended Spots Make It Hard to Break Up With Yellowbook. Today Newsweek will expand on its recent announcement that the publication plans to cut staff and modify its content to handle the decline in subscribers and ad dollars, according to an article in the Wall Street Journal. Newsweek is the most recent, but certainly not the only, national publication to announce the need for cutbacks in what seems to be a growing trend of readers forgoing their print media subscriptions in favor of alternative free news sources such as Internet news sites and blogs. According to the WSJ, in addition to cutting staff, Newsweek will also focus less on hard news and more on opinion and discussion of "hot button" issues. Read more about Newsweek's announcement here. As print media publications continue to decline, public relations practitioners are presented with a new challenge. With slimmer publications and fewer subscribers, the question in my mind is whether pitching press releases to print media is still as effective, or whether Web 2.0 social networking sites and blogs could eventually become a better medium for issuing news. Technorati is a great option for tracking social media. It provides the option of custom RSS feeds so you can track any blog that talks about your company. Co.mments.com allows for blog comment tracking. This is especially helpful to make sure you are monitoring both sides of the conversation. For example, a blog could have a positive post about your company, while the reader's comments could be showing another view. Along the same lines, Blogpulse.com tracks blogger posts by monitoring trackback linked to specific blog entries. For example, a negative post is put on an unknown blog and no comments have been posted. If a popular blogger decides to pick up this post, the news could spread in a second. Blogpulse.com can help you to monitor this type of situation. Yahoo Pipes allows anyone to create a customized buzz monitoring tool. This Web site allows you to set up RSS tracking and filters quickly and easily. You are even able to track Twitter mentions of your company through Yahoo Pipes. For the complete list visit Marketingpilgrim.com. Only blog if you are passionate. If you’re not passionate, readers can tell. In my opinion, the best blogs are written in a way that conveys the writer’s passion for the topic and allows his or her true voice to show through. The most successful bloggers find a way to make their blogs an open dialogue that fellow experts and their readers want to engage in. Know your audience. Holland makes an excellent point. If you know who’s reading your blog it will help you determine the issues on which you should focus, and the way you write. If your readership includes non-lawyers, avoid using a ton of legal jargon that the average person wouldn’t know. If you’re going to blog, really commit. Holland urges lawyers to start slow, but commit to maintaining an active blog with frequent updates. Not only will updating frequently help you to appear higher in Google search results, people will also start visiting daily to read what you have to say. If your ultimate goal is to make yourself an expert in the legal field, or garner a little organic public relations, it’s essential to keep your blog current and relevant to the field and your readers. Check out C.C. Holland's blog post for more on building a successful legal blog. This is an interesting article from Pete Cashmore at mashable.com on the sometimes murky waters of Twitter terminology. If you’re confused by all of the abbreviations and jargon in the world of Twitter, (a.k.a the twitosphere) don’t worry, you’re not alone. In most cases it seems that by adding “Tw”- to the beginning of a word, tweeters have created a brand new vocabulary specifically catered to this micro-blogging service. This new Web 2.0 lexicon has sparked Web pages such as Twictionary and Twittonary, which track all of the new words used on Twitter. To view Pete’s list of 66 words visit his site here. I have chosen a few from his list that I think will be especially helpful for those starting to use Twitter for marketing and public relations purposes. Now that the holidays are upon us, so too are the end-of-year awards dinners and social gatherings. I’ve already attended four events and when I looked around, it was a sea of black. So many people dressed similarly. For men, it’s the black suit, white shirt and red tie. Women - it’s the black dress or suit, black bag and black shoes. If you really want to stand out in a crowd be different. Men: you don’t always have to wear a black or navy suit. Instead of the standard red holiday tie, try a color that compliments your skin tone, hair color or eyes. I know this suggestion may make some of you nervous, but accentuating your best features is not a practice that should be limited to women. People will remember a bold-colored (make sure it’s tasteful) tie or a sharp suit and as a result, will remember you. Just think of it as a smart business development strategy. Women: I’m as much of a fan of the little black dress as you -- every woman should have one in her wardrobe, but why not accentuate it with a unique broach or colorful scarf? A piece of “flair” will make you memorable while still allowing you to wear something in which you feel comfortable. Add a fashionable, bold-colored purse or wear shoes that make a statement. Just remember, if you’re there to network you want to be memorable, not blend in with the “black sea” of people. If you’re still not sure what to wear after reading this blog, contact Megan Kristel of Kristel Closets (http://www.kristelclosets.com/) – she’ll get you and your wardrobe into shape – I promise. So, last night I had a great time visiting with old friends at the Philadelphia Trial Lawyers’ holiday party. I got to spend time with tons of Philly’s movers and shakers from the bench and bar. I even reconnected with colleagues I worked with on the Philadelphia Bar Association Young Lawyers Board in the 90’s. I also had the opportunity to meet a lot of new folks – especially some of the younger attorneys. So, why do I bring this up? Because I cannot begin to tell you how many people I met who did not have business cards with them and an industry association holiday party. It’s PR networking 101 – before leaving your office, stick business cards in your pocket. Referrals are huge in the legal industry. These events present some of the best relationship development opportunities out there. Capitalize on them. And when you do meet someone, follow up. Yesterday I attended an informative seminar hosted by the Bucks County Women’s Business Forum on utilizing Google’s many free services to make day-to-day office tasks easier. 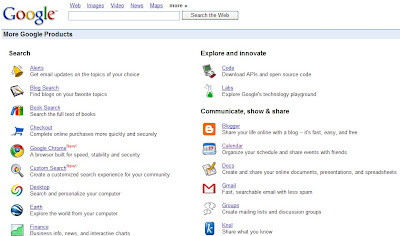 Though Google is known most for its search engine- which now allows you to edit search results, (if a hit on the search results page isn’t relevant, simply “x” it out and continue scrolling) it also offers over 40 free services to its users, including: G-Mail, Google Earth, Google Calendar, and Picasa for uploading photos and creating albums to share with friends and family, to name a few. It would take a series of blog posts to cover all of Google’s offerings, so instead I’ve decided to focus on just a few that I feel are helpful in the office, and direct readers to Google’s blog for more on its features. Google Notebook. If you have pages of meeting notes scattered across your desk, consider using Google Notebook. It allows you to create notes and label them in individual notebooks. So for example, for each client or project, you could have a separate notebook and keep track of every meeting’s business. Google Notebook also has a search feature so if you can’t remember on which day you discussed “issuing the holiday calendar listing,” you can search that phrase and pull up that day’s meeting notes. You can also share your notebooks with colleagues and export them to Microsoft Office. Google Docs. With Google Doc, you can upload a Word document (such as a press release)and then invite colleagues to view the document and make edits. All of the edits take place in real time, so as soon as one person makes a change, another can view it and continue working. There’s also a chat sidebar that allows you to comment about changes as you make them. Google Calendar. It’s a pretty user-friendly calendar that allows you to create an event, set the time and place, add notes, set reminders, create a rule to repeat the event weekly, monthly, yearly, etc., invite others to attend by entering their E-mail address, and probably even more that I haven’t discovered yet. You can also share your calendar with colleagues, so say I’m trying to schedule a meeting with Gina and Leah and one of our clients, I can see both of their calendars simultaneously and find a time when both are available. You can also sync the calendar with your blackberry, iPhone and Apple iCal, and export it to your computer. I would also encourage everyone (either for personal or work use) to set iGoogle as their homepage. iGoogle lets you personalize your homepage with thousands of different gadgets including various news sources, Twitter, Facebook, YouTube, Fandango, Dictionary.com, etc. It’s a great way to organize the Internet sites you use most on one convenient page. Check here for the full list of Google's features. Testimonials from customers are a powerful marketing tool and serve as an excellent referral to potential clients. Customers who can convey their satisfaction in a concise, moving or unique way will promote your business better than any advertisement or direct mailing could. Recently, a client asked for tips on using testimonials. After a little research, I came up with the top 5 ways to use testimonials, and wanted to share them with The PRLawyer’s readership as well. On your website. Place testimonials in boxes or in a sidebar so they stand out. If your website contains sub pages, place testimonials on a related page so that people looking for specific services will see testimonials that speak to your ability to provide those services. In print marketing brochures, newsletters, direct mail or in E-newsletters. Using testimonials in your print materials shows potential clients the level of service and expertise you’re capable of offering from someone else’s perspective which is often more powerful. As part of your E-mail signature. Whether it’s someone who’s been referred to you, or just a new business E-mail, adding a testimonial as a part of your E-mail signature with a link to your website gives potential new clients an introduction and may entice them to visit your website or reply to your E-mail to learn more. Note: This should be limited to potential new business E-mails only. In your office. If you meet regularly with potential clients in your office, ask providers to send testimonials on their company letterhead. Place testimonials in a spot where they will be visible, either framed or in capabilities materials that you can give to prospective clients. “What People are Saying…” page. Create both a print and virtual page. Keep print copies in lobby areas, in your office, and include copies with your print marketing materials and capabilities. Add the virtual copy to your company profile (not your personal one) on LinkedIn, Plaxo and Facebook and on your website. When possible, try to use testimonials with Search Engine Optimized (SEO) keywords so that when people search specific keywords, your testimonials will come up in their search results. Avoid putting testimonials on your personal Facebook or Plaxo account as both social networking sites tend to focus more on personal connections and socializing and less on business networking, but do incorporate them on your LinkedIn profile. If you’re using testimonials in a unique way, we’d be interested to hear about it! This article by Christine Kent found on Ragan.com reminded me of a class I took as an undergraduate at Temple University called Public Speaking. We learned about writing and giving speeches and the best ways to relate to an audience. One technique is to create common ground with your audience. Other important aspects to a great speech involve attention grabbing techniques and the ability to command a room. Kent’s article discusses how Apple Computer´s CEO, Steve Jobs manages to always give an excellent presentation. During Jobs´ presentations he uses interesting images and large projection screens that make him seem very small in comparison. This helps to create the ordinary person illusion for the audience - Jobs is just like you! Demos are also a great way to capture attention and keep it throughout a presentation. Jobs effectively does this with his computer models. The thin Macbook Air unveiling is a perfect example of a great demonstration. Jobs walked on stage and pulled the computer out of a manila envelope to emphasis its extra-slim size. Jobs successfully creates high anticipation for the new product, and has a knack for holding on to details of upcoming products until the very end of his presentation. This element of surprise keeps the audience on the edge of their seats the entire time. When speaking, he isn´t tied to his PowerPoint presentation. Many presenters fall into the habit of reading their slides word for word. Preparation beforehand will help the presenter feel comfortable with the material and prevent the need to read. Body language such as hand gestures and facial expressions should convey excitement about the topic. Above all, Jobs always conveys his passion for his job during his presentation. The audience is immediately aware of his enthusiasm to share the latest Apple product and the presentation becomes more intriguing. These are some inspirational tips to keep in mind the next time you are presenting to employees or a potential client. Okay – so I’ve decided to start a running “Pet Peeves” list on our blog. I find that there are so many little things that companies can do to boost their public presence everyday. Just yesterday, I explained to a reporter who was interviewing me about legal marketing trends – that every public communication should be treated as if you’re on stage presenting to an audience of thousands. Whether it’s a Web site, blog, advertisement, press release, seminar presentation, Twit on Twitter, status update of Facebook, or information on LinkedIn, we must remember that they’re all public communications. So – today’s PR Lawyer’s Pet Peeve – Web site pages that cannot be formatted to print in a branded, efficient and easy to read manner – WASTE. Today, I printed an article from a colleague (who will remain nameless) who is a “legal marketer.” The two page article printed on six pages and wasted my ink and paper! Why not just add a clean “print this page” feature to your Web site. Invest in your business and practice what you preach. And don’t forget, before printing this blog post, decide whether it is necessary. Think Green. So the great holiday card debate continues…. I have received three e-mails to date with holidays cards. One was an attached PDF that didn’t excite me at all. One was a link to a Blue Mountain e-card (boring). And finally, I received one today from Fish & Richardson (see http://cl.exct.net/?ju=fe5f117475670c7e741c&ls=fdeb16787162027c7d107870&m=fef91273766d05&l=fe8c15777461037470&s=fe3717717563047b741575&jb=ffcf14&t=) that hit the mark. This is the first e-mail holiday card that I’ve received so far this year that I thought was very well done: very professional, well branded and a good use of technology. Now – if you’re not going to do as good a job as Fish & Richardson, please think twice about sending the e-card for the holidays – especially not to your important clients and prospects. Regardless of whether you’re a law firm, accounting firm, marketing agency, public relations outfit, or any other service-based organization, whenever you send correspondence; you should put your best foot forward. Also remember that a well thought out, clever holiday card is always more effective that the typical and mundane “peace on earth” with the dove or earth image. They’re run-of-the-mill and unless you would call you’re company “run-of-the-mill” then you shouldn’t use them. It’s hard to turn on the TV or pick up a newspaper without hearing about major corporations being forced to slash jobs to stay afloat. Issuing bad news such as lay-offs, branch closings or company restructuring is one of the biggest challenges to a communications team dealing with both the public and the company’s concerned employees. A great article by Sarah McAdams on Ragan Communications’ Web site provides corporate communications strategies to manage financial crises from Beth Haiken, Vice President of Corporate Communications at Providian Financial during its financial crisis prior to being sold to WaMu (now owned by JPMorgan Chase) in 2005. Not only did Providian find itself in financial trouble, the company was also faced with a multi-million dollar class action suit from cardholders who claimed Providian had misled them about credit card fees and rates. According to the Ragan Communications’ article, Providian was forced to downsize from 13,000 employees to 3,500 in about a year and a half. With a new management team in place, Providian issued a 5-point plan to restructure the company which was shared both internally and with the public. According to Haiken, management was frank about the need for downsizing. To effectively address employees’ concerns, the communications team coached managers extensively, providing talking points and Q&A, and training managers who were not experienced in giving employees bad news. Never announce a problem without also announcing a solution. Employees and the public alike want to know that even though the company is struggling financially, the management team has a plan to turn things around. Using the Providian example as a framework, their 5-point plan acknowledged the problems that existed and provided a multi-faceted approach to address them. Realize that employees are not stupid. At the very least, your employees deserve an explanation. They are capable of understanding business decisions, even difficult ones, and though they may be angry or worried, chances are they will respond better if they feel management is being truthful with them. Employee morale may suffer initially, but ultimately if employees feel management has a policy of openness, it will foster a more positive and trusting environment. Read McAdam’s blog for more on corporate crisis communications. Jeff Blumenthal, the legal reporter for the Philadelphia Business Journal, wrote a nice piece about Sayde Ladov, the next Chancellor of the Philadelphia Bar Association. I'm looking forward hearing Sayde's keynote at the Philadelphia Bar Association's Annual Meeting and Luncheon on Monday, Dec. 8 at noon at the Park Hyatt Philadelphia. Current Chancellor, A. Michael Pratt will pass the torch to Sayde, whose term will officially begin on January 1. I have enjoyed working with Michael this past year in my capacity as both the Justinian Chancellor and chair of the Bar-News Media Committee. I equally look forward to working with Sayde. Of note, The Justinian Society will host a luncheon in honor of Sayde on February 19, 2009 at the Union League. If you're interested in attending, call (215) 545-0706. Jacob Morgan poses a thoughtful question, "What's more measurable social media or traditional media, and why?" on his blog post, "Why Social Media is More Measurable than Traditional Media". Morgan offers a number of ways that social media can be measured as part of an advertising or public relations campaign. He points out that typically traditional media is measured by "media impressions," or number of eyeballs that saw the ad or public relations piece. Surveys and questions are often also used as a follow-up to a campaign to gather statistics and gauge success. I agree with Jacob that social media has many more ways of measurement and believe it is more effective in today's society to reach certain audiences. * The number of Web site hits and traffic measurement on your site with tracking sites or programs. * Number of comments left on the Web site, blog, Facebook or Twitter account. * Tracking of brand image perception through consumer feedback and interaction. This can be a great monitor of trends in consumer perceptions. Jacob notes that if consumers were bashing your brand a month ago but are now very happy with it. That can be seen as a success in change of brand perception. * Number of times others have shared information about your brand or company. For example, "retweets" on Twitter are a great way to see the chain of word-of-mouth spread of information. * Number of subscribers on your RSS feed, followers on Twitter, or friends on Facebook or other social media sites. * Number of link backs to your page or to information about your company or brand. The more link backs you have the better it is for your site because of Search Engine Optimization (SEO) Click the link to learn more about SEO from SEOchat.com. The major difference between the measurements of each type of media has to do with their effect on the Return On Investment (ROI) for the business. Now more than ever consumers have ways to ignore messages with traditional media. Social media does require invested time but many Web sites are free and offer peer-driven, word-of-mouth interactions and rapid ways to disseminate your message. However, social media's success is often hard to predict at the outset. Morgan points out that best way to effectively measure social media is to look at many variables and overall social media impact. It is important to constantly evolve once your company is actively engaging. Blame writer’s block, information overload, or whatever you like, some days I just can’t come up with a topic to blog about. Today is one of those days (I blame my all-consuming anticipation of pumpkin pie and the Eagles game tomorrow night). It has seemed lately that when writer’s block strikes, I’ve used Twitter fanfare to get me by. Today I brainstormed and... heard crickets. Then, and I’m 100% truthful when I say this, I logged on to Twitter and noticed a tweet from The PRLawyer, Gina Rubel, about a blog she was reading from John Jantsch, of Duct Tape Marketing, on what he calls “Contentapation,” also known as- writer’s block. There’s a little Alanis Morrisette brand irony for you. John has some great suggestions for overcoming Contentaptation. One, coincidentally, is to utilize Twitter via Tweetbeep, which allows you to set search terms and then alerts you when one has been met by someone you follow on Twitter. Get the rest of John’s excellent tips here, and Happy Thanksgiving, all! Jon Jantsch from Duct Tape Marketing.com recently wrote a post regarding pre-planned social media activity. For example, does planning your Tweets on Twitter take away from the social spontaneity of the site? I don't think so. If effectively planned with the help of some of Jantsch's suggestions, social media can be a great addition to your company’s PR plan. I also agree that in today's fast-paced world many social media enthusiasts want to engage and participate in social media but struggle to find the time. According to Jantsch, automation should be a supplement to your social media activity but should not take the place of genuine and spontaneous Tweets. Below are some effective tools that will allow business owners to successfully and easily engage consumers through social media without a lot of time from Jon Jantsch. TweetLater or EasyTweets are two sites Jantsch uses frequently. Each can automatically send a welcome and thank you message to every new follower to his Twitter account. These tools should not be abused by sending spam messages but instead used as a way to greet a new follower and get the networking process started. Twitter Tools is helpful for those using WordPress as a blog provider. This plug-in publishes blog updates to your Twitter account. This should not be the only way you update your Twitter account but is a way to keep Tweets fresh and new. The same application is available for Facebook. The Twitter application updates Facebook with the links to the updated content on your blog. Another application on Facebook, called the Feedheads application, allows for the posting of RSS feeds from Google Reader or Bloglines to your Facebook account. TweetDeck is an application downloaded on your desktop that combines Twitter's direct messages, replies and searches on one screen. Hopefully these suggestions will help you and your company save time while still successfully engaging in some exciting social media Web sites! Motrin was feeling some pain last week after customer backlash over a new ad campaign forced the company to take down a 50-second video it had added to its Web site last Saturday. The clip targeted moms suffering from backaches due to their infants’ slings and over-the-shoulders carriers. Many felt the ad was offensive, and portrayed new moms in an unflattering light. 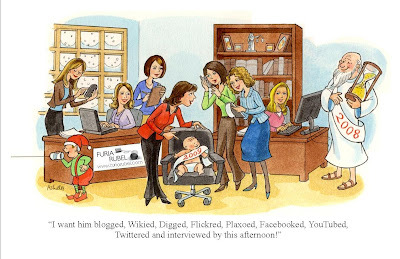 Twitter moms tweeted in force, lambasting Motrin for a video clip they viewed to be insensitive and insulting to women at a very vulnerable time- when they are new moms. According to Ragan Communications, a Twitter handle, “motrinmom,” was created over the weekend with a tweet that read: “If I look tired and crazy, people will understand why,” with a link to the video. Despite an apology from Motrin on its Web site and removal of the video clip, the conversation raged on throughout last weekend and even into early last week. While initial tweets came mostly from angry consumers, later tweets came from people commenting on the impact of social media, while still others were asking if the ad was really so offensive, according to the Ragan article, Twitter users wrestle the Motrin brand to its knees. For public relations practitioners, the Motrin snafu presents an interesting case study about the impact of social media and consumer relations . Michael Sebastian, author of the Ragan article makes an excellent point, in the social media age, a PR professional’s job is round-the-clock. With people using social media sites 24/7, your response time needs to be immediate. It’s critical to protecting your brand and preventing a customer relations crisis. Marketing Sherpa recently featured an interesting article which touched on two topics that we like to inform our readers about here at The PR Lawyer- social media and blogging and the legal industry. "How to Keep Your Blog Out of a Courtroom - Advice from Legal Pro on Providing, Creating Content" provides some tips on how to avoid legal troubles with your online blog. The article consults with Nina Yablok, a Business and Corporate Attorney at Law who has been a business lawyer for 30 years. Since 1993, she has been working with clients who engage audiences with message boards and chat rooms. With years of experience in the legal industry and social networking, Yablock comments on the changes in technology but the consistency in liability concepts. Yablock explains, the more the author of a blog edits user comments, the more responsible they become for the overall content on their blog. For example, content "creators" are always responsible for what they create, but content "providers" are not. According to the Marketing Sherpa article, "YouTube, for instance, is not legally responsible for every video on its site." Don't be so quick to edit offensive or illegal comments on your site. "The more you monitor and regulate user content on your site, the more you're liable for what is said," Yablok says. "As soon as you begin deciding which comments stay and which comments go, you become more responsible for every comment on the site." Set a standard for monitoring comments and stick to it. If a comment breaks those standards, delete it. If it doesn't break those standards, leave it. Bad language or highly offensive remarks should be taken away; it is most important to worry about offending your blog readers. By following a casual editing environment, "you're just a provider. You're going to be excluded from liability under an assortment of laws that protect the people who provide rather than create content," Yablok says. Quoting should be limited to a few sentences from an article or person and include proper links back to the original content or Web page. Large paragraphs or pages of quoted text can be seen as plagiarism. When discussing famous people, a rule of thumb is to not use their fame to promote your product or company without their consent. Be wary of posting celebrity images on company blog as well. It can be seen as a type of endorsement. Be careful with trademarks on your blog. Using images or implying connections between your blog and a trademark can lead to a lawsuit. However, discussing a trademarked product or service is something you're able to do. Posting a caveat at the beginning of the post to avoid any type of confusion when talking about trademarks. Be wary of passing along negative information or continuing rumors. Protect yourself by citing your sources. Capturing and saving screenshots of your content with the date as evidence is a wise thing to do in order to prove that the rumor was not started by you. As with all legal concerns, it is important to consult with an attorney about your specific case and situation. These are just some helpful tips provided by Nina Yablok, Business and Corporate Attorney at Law. Michael Liedtke of the Associated Press (AP) reported today that "Google empowers users to edit search results - Your favorite Web sites get top billing, disliked destinations get discarded ." He says, "If Google delivers useless search results, just erase them and you won't see them again. That's possible under a new system Google Inc. unveiled Thursday. Hoping to give its search engine a more personal touch, Google now lets users reshuffle results so their favorite Web sites get top billing and disliked destinations get discarded the next time they enter the same request." For the full story on MSNBC, go to http://www.msnbc.msn.com/id/27830158/. I have blogged before about how much I love my Web site aggregator, Bloglines, which helps to organize all of my RSS feed subscriptions to various blogs and websites. Bloglines is great because every time one of them is updated, it neatly organizes the updates for me to check when I have a free moment. Steve Rubel, active blogger and marketing strategist, and VP-director of insights at Edelman Digital weighs in on what he thinks is the reason for the rise in news feed popularity while RSS feeds remain stagnant. Steve points out some interesting differences between the two on Advertising Age's Web site in, "Why News Feed is Growing While RSS Has Stalled: Peers"
RSS, or Really Simple Syndication, is a delivery device that is used by Internet publications including blogs. When a RSS-enabled Web site adds new content, the updated information immediately goes from RSS feed to your designated RSS aggregator. My RSS aggregator of choice is Bloglines but there are many others to choose from on the Internet, like Google Reader and NewsGator. RSS is helpful because it saves you time surfing the Web and actively checking your favorite blogs and sites for updated content, and holds all of your content in one place. I would recommend a web-based aggregator like Bloglines because you have the ability to check for updates when you’re on-the-go, so long as you have access to the Internet. To learn more about RSS feeds visit, Bacons. Steve sited a Forrester Research report published last month about RSS-feed adoption. In 2005 the survey found that 2% of consumers subscribed to a news feed. Now the percentage is up to 11%. Although this is a huge jump in subscribers, 40% of the remaining 89% of consumers are still uninterested in RSS Feed. News feed is driven by user updates and has become much more popular thanks to the high volume of social networkers in the Web 2.0 age. Web sites such as Facebook and Twitter with their real-time updates on the home page, allow for instant posts by peers- an important difference between RSS and news feeds, since typically one's peers are their most trusted source of information. As anyone who frequents the PRLawyer may have guessed, I have developed a bit of an obsession with Twitter. In fact, I worry that if I dedicate another blog to being a Twitter cheerleader, I might come in one day and find the PRLawyer’s password mysteriously changed. Nevertheless, there is a great blog from Darren Rowse of Twitip that I recommend to any Tweeter interested in branding their Twitter page. In addition to the 12 generic backgrounds that Twitter provides, you may have noticed in the Settings section under Design that there are options to “Change background image” and “Change design colors.” Rowse urges, and I agree, that changing from the generic aqua blue background is an important first step even if you have no interest in branding your Twitter page. Choosing from one of the other 12 background choices will at the very least make it seem like you’ve actually spent time familiarizing yourself with Twitter’s features and will also show a little personality. For those looking to create a brand-specific Twitter page there are some great sites on the Web where you can find unique backgrounds, or pay to have a custom background designed. I recommend TwitterImage.com where there are a myriad of backgrounds to choose from and for $100 you can get a custom background created. For companies using Twitter for customer relations, $100 will likely generate a much higher return when customers start following your Tweets and engaging in dialogue about your products. If you don’t want to spend the money to get a custom generated Twitter page, you can always attack creating a background yourself. 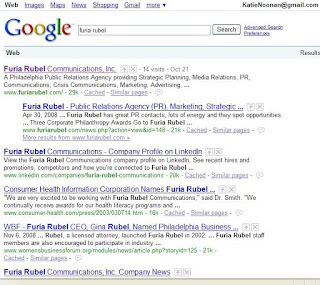 I spent time attempting to brand Gina Rubel’s page using Furia Rubel’s brand materials. It was definitely time consuming, but for Tweeters who have a knack for design this is a viable option. Keep in mind the varying monitor sizes and differences in screen resolution. After spending quite a bit of time to come up with a background I was happy with, I was eager to log on my Mac at home that night, only to find that the formatting was much different. 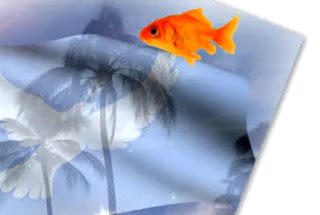 Twitter Image- http://www.twitterimage.com/. Provides free and custom Twitter background interviews. Twitter Patterns- http://twitterpatterns.com/. Provides free pattern backgrounds. Colour Lovers- http://www.colourlovers.com/. Provides thousands of pattern backgrounds that can be catered to a Twitter page. One of the many industry e-mails I receive every day is Issues and Trends from the Public Relations Society of America, or what is more commonly referred to as the PRSA. PRSA is the industry organization for public relations professionals in the United States. As an undergraduate, I was actively involved in the Public Relations Student Society of America, the collegiate branch of the PRSA. One e-mail just featured the article titled "Election Offers Lessons in Transitions: Ten Timely Tips for Tapping New Blood—and Rotating Staff off Key Accounts" by Roxanna Guilford-Blake from The Council of PR Firms' publication, The Firm Voice. Although, I'm currently in Spain, the results of the United States Presidential election were felt throughout the world. Damian Corrigan's post on the About.com's Spain Travel Blog is a good read to find out more about the feelings here in Spain. The overall theme of President-elect Obama's platform is one word, change. According to Roxanna Guilford-Blake, this principle of change applies to agency life as well. I have paraphrased some of the tips below from industry execs for creating and easing into change in the workplace as well. First Ask the Questions… When? and Why? - Change needs to be strategically planned. Find out what is best for the client relationship and the employees. Sometimes a certain account needs new thinking, new ideas and fresh minds working on the team. At that point, proactive as well as reactive actions need to take place. Don't wait for the client to become bored and ask for change. That is a recipe for lost accounts. Next, Focus on the How? - The key to smooth transition is consistent and open communication with the client. The open lines of communication will allow for more preparation time. This can help the agency to staff a client team appropriately for upcoming needs or events. Do not Communicate Change via E-mail - Shifts and changes to an account should not be handled via e-mail. Step-by-step communication, either in person or on the phone, is the best way to ensure that everyone, employees and clients, is on the same page with the transitions. Honesty- Transparent communication is needed in this type of delicate situation. By ensuring honest communication, you are preserving goodwill among the employees and maintaining the client's trust. All those involved deserve to know why the changes are going happen, or why they have been made. Candor can come in handy during these types of situations as well. Radical Change is Not Always the Answer - Consider lower-level employee changes. Mixing up a team ensures fresh ideas and also gives new experience to junior staff members. Recognize Contributions - It is important to acknowledge employees who are leaving current accounts. Engage them in the transitional process and encourage them to share their knowledge of the account and specific industry. Quick assimilation onto a new account is the key to a successful transition for these employees to assuage egos. Going back to the idea of honesty; this will help to preserve bruised egos also. Ensure Proper Training - Proper training and preparation is the responsibility of the firm or agency. Preparing your employees with the knowledge they need to be successful will ease the transition as well. Whenever Possible Consult with the Client First - It is important to cultivate a good working relationship with clients and be open and honest about firm changes. Be sure to include them in the news of new hires or other transitions within the company. If a passionate, driven employee becomes free to work on a specific client account, it is important to relay that information to it least let the client have the option to help decide. The overall key to success during a transition is quick communication. News needs to be conveyed rapidly. Despite Preparation, Bad Chemistry is Possible… and Sometimes Unavoidable - It happens. The best way to deal with this issue is to rely on the good will that has been cultivated with both the client and the employees undergoing the changes. There needs to be an open atmosphere where the client, and even employee, can be comfortable saying, "This isn't working for me." In the long run, the above tips will pave the way for smoother transitions and make it an easier process for everyone involved. It was brought to my attention by my dear friend, Cheyenne of http://www.healthheartsoul.com/ that there is a large storm Crisis in the Dakotas, and folks are in serious trouble on the reservations. According to her sources, "the seriousness of this hasn't made it into the main news. " So some of Cheyenne's friends have been in touch with the folks on the ground in the Dakota reservations to determine what people can do to help. If you are so moved to participate, please do. If you aren't or cannot, would you be so kind as to network this information so those who can will know? and Monica, who is working in the Incident Command Post dealing with the crisis in the Black Hills. I asked for a list of things most needed as there is no electricity and heat. And for anyone who can, I imagine any stoves that could be sent with oil or gas, etc. would be greatly appreciated. Prayers and prayers circles also requested. Thanks for any and all that can be done. Please network this as far and wide as you can. Time seems to be of the essence. They are so deeply grateful. I do believe this is the "We" so many great leaders over time all over the world and in America have spoken about, and that so many of us have learned to live as we can. And perhaps the opportunity to remember and keep remembering all the Original peoples here as we are able, will continue to allow us to become the world we wish to see. It is important to send to Monica as she is working at the Incident Command, and keeping the inventory for distribution. Blessings and Gratitude to you all, and thanks again Drai in Denver for putting this in motion and bringing it to my attention.